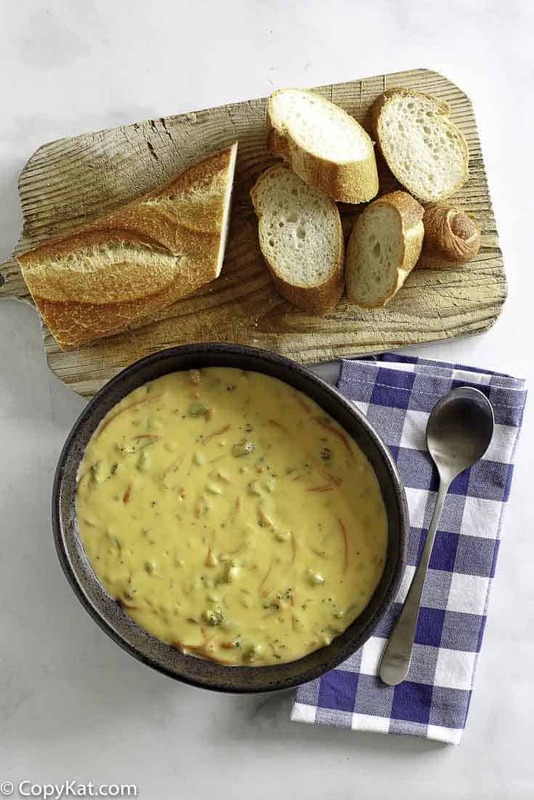 Panera’s broccoli cheddar soup is a favorite of so many of us. 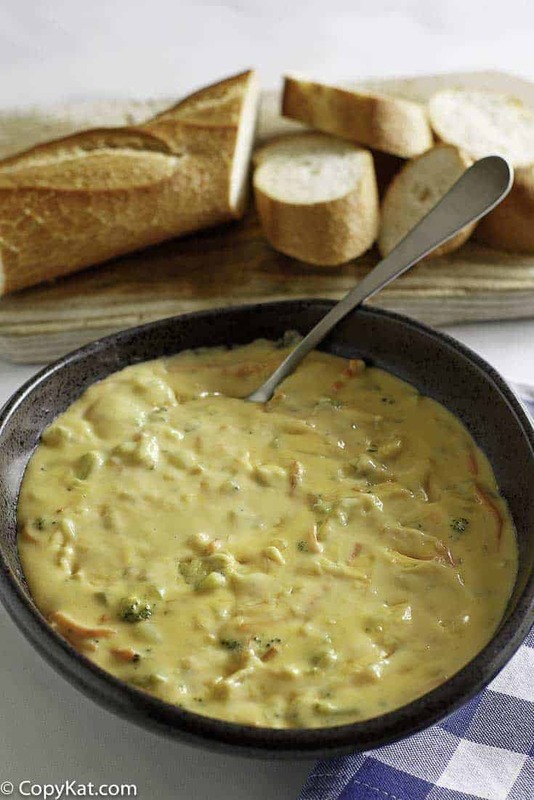 This creamy, broccoli cheddar soup is perfect for a hearty lunch. This is easy to make—just take frozen broccoli, fresh carrots, and two types of cheese to make this soup. You can purchase bread bowls from the grocery store—then you will have broccoli cheese soup just like at Panera Bread. Panera Bread is a bakery-café chain of casual restaurants in the United States and Canada. There are currently more than 1,900 Panera Bread bakery-cafés offering soups, pasta, sandwiches, salads, bakery items, and specialty drinks. The name Panera is a Spanish word that means bread basket or bread box. To find out all the things you may not know about Panera Bread, click here. Panera Bread is especially known for their delicious homemade-tasting soups which change daily. Their soups use only high-quality ingredients and you can even have your soup served up in a fat, round, crunchy bread bowl. Panera’s Broccoli Cheddar soup is a favorite with lots of us and my recipe copycats the fresh ingredients and flavors of this popular dish. There are fresh carrots and onions in here, but for the broccoli, you can use fresh or frozen if you wish. Frozen is often more convenient because it’s already chopped up. Whichever way you go, you’ll end up with a rich, creamy soup that’s perfect for a hearty lunch and warming the soul. You are going to love this copycat Broccoli Cheese Soup recipe. I love to serve this style of soup with popovers or fresh yeast rolls with butter. Or, with a thick soup like this one, you can serve it in bread bowls just like Panera does. You can buy bread bowls from some stores. If you have leftover soup and need to reheat it, just add a little milk because it may have thickened in your refrigerator. 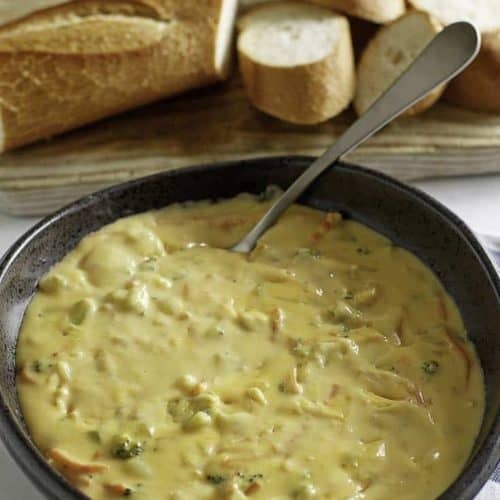 Panera broccoli cheese soup is so easy to duplicate, you can put it together in no time. Try this recipe—it tastes just like it does in the restaurant. If you enjoy Panera Bread recipes, you can find more, including soups, by clicking on the links below. In a large saucepan, melt the butter. Stir in the flour and onions. Cook for about a minute, then slowly add the half-and-half, about 1/4 cup at a time, whisking until thickened and smooth. When all of the half-and-half is incorporated, add the broccoli and processed cheese. When the cheese is completely melted, add the chicken broth 1 cup at a time, stirring occasionally, until soup is well mixed and has a consistent texture. Add the carrots and simmer for about 10 minutes. Stir in the cheddar cheese and cook for 10 minutes more. Season with salt and pepper to taste. Serve when all the cheese is fully melted and blended through. Have not made this recipe yet but sounds very good. One question – can you freeze this soup, thaw and reheat with success? Just the two of us so a lot of leftovers get frozen. I think reheating works ok, the cheese breaks down a little, but it still tastes good. So I’ve made this soup twice and I really don’t like it at all honestly to me it tastes nothing like Panera and to me is kinda gross…. I’m not posting to be a jerk, I’m posting because people are raving about this recipe and I don’t like it at all so I’m wondering why, what could I possibly be doing wrong??? I used velveta and for my shredded cheese I used medium. I am sorry you found this recipe gross. Can you be more specific about what you didn’t like? Was it a texture thing? Was it too salty? This could help in diagnosing what didn’t work out for you. Is there a version that can be made in the slow cooker? I have not created one yet, I am cautious about this because I don’t want the broccoli to over cook. Which directions are correct…the video or written? They are a bit different. Also, you add more butter in the video but don’t say how much. I’m confused! Please follow the written directions. This was my first time on your site. I made the soup tonight. It turned out better than I thought. It was very delicious to me. I’ll get my husbands opinion, also. I love broccoli and cheese soup and I had some at work this week. So it was still on my mind. I used regular chicken broth. Thank you. I made this soup today and it was delicious. I did substitute one cup of cheese whiz for the processed cheese (it is what was available) but otherwise followed the recipe exactly. Thank you so much! Do you thaw the frozen broccoli first? OMG! This is so good! Thank you!!!! I am glad you like the recipe! First time on this site, first time making this soup. I made it to the T and it came out awesome! Will be on this site often for more things to try for sure! This soup is soooo good!!! LOVE IT ??? ?